That’s Elspeth in purple way off to the left. Yesterday I took Elspeth and Evelyn to the birthday party of a little friend of ours, Oliver. He was turning three, and in his honour several small people assembled in a park to play. I was watching the children play, and noticed once again that Elspeth is a stand-offish child. She is always a little apart, rarely interacting with other children. 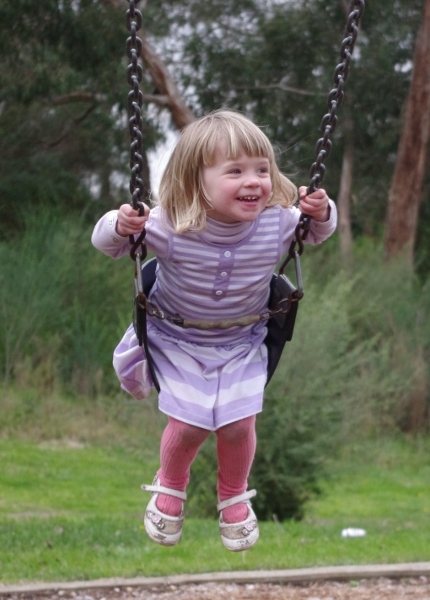 While the other kids played on the playground equipment, Elspeth walked around the edge, balancing on the planking around the outside. She isn’t violent or antagonistic; she just seems to prefer to play alone, or with one or two trusted people. It is something which has worried me a little in the past. I recall being the same as a child, and in truth that tendency has never really left me. I’m not a fan of big groups, crowds, or strangers. I have always preferred intimacy, small groups of well-known friends, or solitude. Watching Elspeth makes me wonder if I should be worried about her lack of social interaction, and what – if anything – I should do about it. Seeing, as I do, myself reflected in her behaviour, makes me feel better about it. I managed. I still manage. I am happy with how I am. I am capable of communicating for purposes of work or study, I can handle everyday situations like grocery shopping or calling my local council. There is no reason that, with some time and practice, Elspeth couldn’t also get used to doing those things. I think, having reflected on my own characteristics, I should be less concerned about seeing them in Elspeth. It’s okay to be a loner, despite the stigma often attached to it. It’s not something that needs to change; it’s just who she is. It’s who I am. And I’m okay with that. 1) I now I have some quite close friends whom I really know very little about. 2) I sometimes get the feeling people think I’m not interested in them, and that perceived lack of interest is reciprocated. My problem is that I still feel awkward asking what I regard as personal questions, and my definition of that is quite broad. I might not ask a near-stranger about things like: their health problems, their relationship, their family, their financial situation, their religious views, their political leanings… and so on. That means I’m often stuck with general conversation like “How are you?” and then I… stop. And because I don’t delve right into those issues, the friendship may progress for quite a while based on trivialities, and eventually there comes a point in time where it becomes silly to start asking those personal questions. So, I suppose I must work on my social skills, and learn to stretch my funny little boundaries. Don’t be surprised if I start asking weird questions in the near future. Things you might assume I know already, just because we’re friends, but which in truth I never quite got around to asking about.